U.S. stocks slipped from their all-time highs on Thursday, weighed down by Apple and the hawkish stance of the Federal Reserve, which hinted at raising interest rates for a third time this year despite low inflation. Shares of Apple fell 1.7 percent and was on track to post its biggest two-day decline since June. The stock was the biggest drag on the three major indexes. Investors were also absorbing the Fed’s decision to start ending monetary stimulus by reducing its approximately $4.2 trillion in holdings of U.S. Treasury bonds and mortgage-backed securities - acquired in the years after the 2008 financial crisis - from October. “Today’s movement is most likely a give back as people digest the Fed statement and press conference,” said Michael Dowdall, investment strategist at BMO Global Asset Management. At 10:53 a.m. 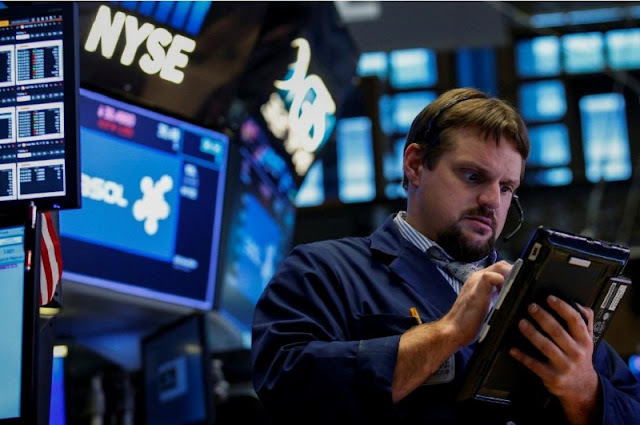 ET (1453 GMT), the Dow Jones Industrial Average was down 9.04 points, or 0.04 percent, at 22,403.55, the S&P was down 4.57 points, or 0.18 percent, at 2,503.67. The Nasdaq Composite was down 34.31 points, or 0.53 percent, at 6,421.74. Seven of the 11 major S&P sectors were lower, with the technology index’s .SPLRCT 0.76 percent fall leading the decliners. Nvidia pared losses to trade down 3.1 percent after GlobalFoundries, which fabricates chips for Advanced Micro Devices, said Tesla had not committed to working with the company to develop its own artificial intelligence chip for self-driving cars. Advanced Micro pared gains to trade up 0.3 percent, while Tesla was off 0.8 percent. U.S. stocks have continued to climb this year, with the S&P up about 12 percent so far, helped by strong corporate profits and optimism that U.S. President Donald Trump will cut taxes for businesses. Valuations are stretched with the S&P trading near 17.6 times expected earnings, compared to its 10-year average of 14.3, according to Thomson Reuters Datastream. Shares of Calgon Carbon soared 61.9 percent after Japanese chemical manufacturer Kuraray agreed to buy the carbon materials firm for $1.107 billion. Advancing issues outnumbered decliners on the NYSE by 1,340 to 1,319. On the Nasdaq, 1,455 issues fell and 1,199 advanced.